The Place. Haiti has come a long way since January 2011 when a massive earthquake rocked this small Caribbean nation. Slowly but surely the slabs of broken concrete have been chipped to rubble, mostly by hand, and carted away and reconstruction began soon after in the midst of sprawling tent cities. Street clearing programs established to remove mountains of rubble have transitioned into street cleaning programs, with a noticeable positive effect on the look and feel in many parts of the city. Resilience and Faith. The people of Haiti are resilient. Surviving 200 years of bitter living conditions first under colonialism and even through independence, from one corrupt leader to another, it often seems little is left but to be resilient. But there is more going on then is first easily seen. 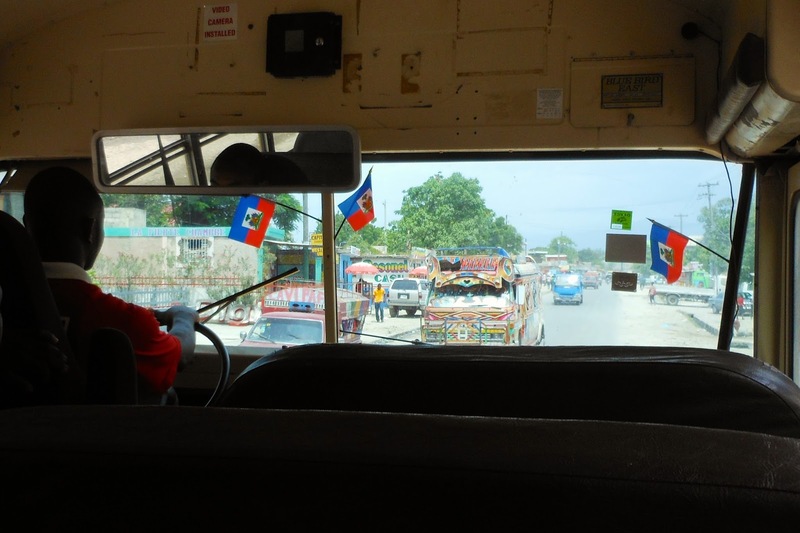 From its voodoo past, Haiti is slowly transforming into a hopeful country. Many decades of Christian missions, embodied in often small scale neighbourhood level efforts, provides a marked counter-point to the despair and discontent one might expect to find. Hope. It is true: many (if not most) missions have the word "hope" in their names. So many, in fact, that one can hardly be faulted for getting their names mixed up. But hope is in there for a reason, because Christian missions, when done well in a culturally sensitive, patient, "long perspective" way brings hope not just for education, jobs and material betterment but hope to the soul as well. Life is Hope Orphanage. This orphanage was started by Haitian pastor Jean Larochel as a response to orphaned children, not necessarily of parents who have passed away but of parents unable to feed, house and care for them. Through no fault of their own these children face the potential of abandonment but often worse; becoming indentured servants to other, slightly better off households willing to buy their services. These children (often referred to as "restaveks", Creole for the French "reste avec" or "to stay with") seldom get schooling, are often abused and receive the worst morsels of food in often already poor households. These children grow up with little hope for a productive future…but Pastor Jean wants to change that. A Place to Call Home. Life is Hope Orphanage was established before the earthquake and quickly grew in numbers after the earthquake. Almost 170 children now live in two rented facilities but these are not suited or large enough for the children. Renting is also an unstable situation, with tenants suffering at the whim of landlords. So Praying Pelican Missions has come alongside to help by purchasing a parcel of land and inviting eMi to master plan their property. Re-uniting Families. But while we were tasked to design an orphanage, a loving and caring home for such children, the intent is not for these children to be adopted away from Haiti. In fact, a major goal is to reunite them with their birth families. But the only way to achieve this is if the parents can be able to afford to take them back. So the orphanage is step one, the next step in Pastor Jean's vision include providing vocational training for adults, many of them the parents of these children. Another part of the vision is to establish a school and community centre, where children receive a good education and families come to build community. Baby Steps First. But the first step is to build the orphanage and an adjacent guesthouse. This guesthouse will provide visiting teams (such as eMi!) a place to stay but also become a funding source for the orphanage and a place where skill and job training can happen. Project Photos. A new project video has been added to the right-side menu and a new set of annotated photos has been placed in my Photo Gallery with various options to view it. If you want to browse the set, click here. If you want to see the titles and read the captions of each photo, click here. Thank you to all who have made this work possible through your financial support, encouragement and prayer; you have been a part of making this project, and the resulting touched lives, a reality.